What Is the Commitment Scale? 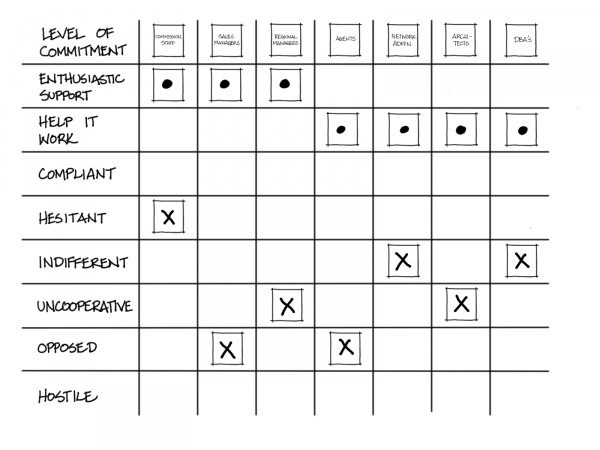 The commitment scale is a stakeholder analysis technique. This technique gauges the current level of stakeholder commitment to a project, as well as what level of commitment is needed to ensure the project’s success. A team working on a commission system created their stakeholder map, then thought it would be a good idea to discuss the commitment of the various groups to the project. The following figure shows the resulting scale that they came up with. The commitment scale is most applicable when a team is starting a new project that does not have clear, unanimous support from all stakeholders or on projects that are introducing significant organizational change. It may also be helpful when a team is working with a set of stakeholders with whom they have not worked before. It’s a good idea for the team to have a discussion surrounding the commitment scale when they are first getting started (during iteration zero, for example) so they can establish their plans for engaging with stakeholders early on. 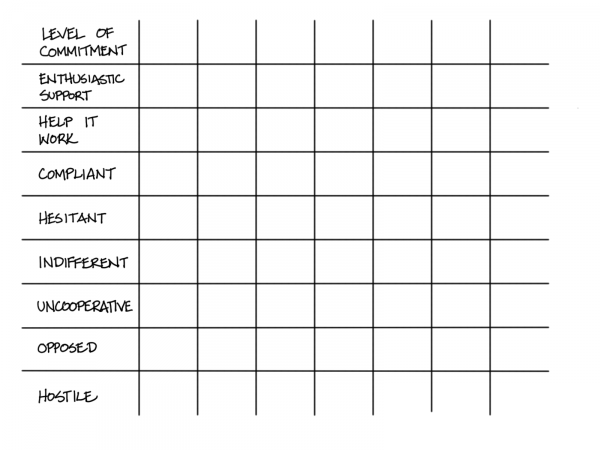 The commitment scale is best suited to guiding team conversations about how they will interact with their stakeholders. Members of the team may have various assumptions about some stakeholders’ impressions of the project. This technique provides a means of getting those assumptions out in the open and helps the team determine a course of action to increase support for their project. 1) Gather the team together and explain that you need to discuss how you will work with the various stakeholders. 3) Identify the key stakeholders the team needs to discuss. Start with groups, but the team may identify some influential individuals who need to be discussed separately. 4) For each stakeholder, discuss as a team the stakeholder’s current level of commitment and where the stakeholder needs to be in order for the project to succeed. It’s helpful to use sticky notes to represent current and desired levels of commitment, because the perspective of the team may change frequently throughout the discussion. See the example above. 5) After identifying the current and desired levels of commitment, identify the actions needed to move the stakeholder from the current commitment level to the desired level. These actions will influence how you engage with that stakeholder going forward. Some people consider the nature of the information on the commitment scale to be controversial, so it’s best to use the commitment scale to guide a conversation and determine action plans, but not necessarily persist the scale itself. The information contained in the scale is not of the type that teams would directly ask their stakeholders. Because of this, teams using this technique as a discussion starter may find that most of their information comes from observa- tion or discussions with people who have good insights into the various stakeholders such as the project sponsor. The focus of this technique will be on stakeholders who are not already part of the team, but through this discussion the team may identify additional people they need to add to the team because those people need to be very supportive and engaged in the project. Not every stakeholder needs to be brought all the way up to “enthusiastic support” in order for a project to be successful. Rath & Strong Management Consultants. Rath & Strong’s Six Sigma Pocket Guide. Rath & Strong, 2000. If you learn better with video rather than reading, you may want to check out Analysis Techniques for Product Owners Live Lessons, a set of video training sessions that show you how to apply analysis techniques to product ownership. Lesson 2.2 focuses on the commitment scale.